GRAND ISLAND, NE - The Nebraska Danger jumped out to a 39-13 second quarter lead and never looked back as they dispatched of the Bismarck Bucks tonight, 66-44, in the Indoor Football League season opener for both teams. Nebraska's win was the first career win for Pig Brown, who took over as permanent head coach immediately after last season. The Danger move to 1-0 on the young season, while the Bucks fall to 0-1. Quarterback Tommy Armstrong's three-yard run with 9:22 remaining in the opening quarter put the Danger up 7-0. The Bucks drew to within a point on a three-yard run from Mike Tatum. Armstrong them hit Gregory Dent for a 30-yard touchdown. The Danger went up 21-6 when Seyvon Lowry recovered a Bismarck fumble in the end zone. The Bucks pulled to within 21-13 with 1:54 left in the opening quarter on John Gibb's 13-yard touchdown pass to Tatum. Nebraska added to their lead with a 28-yard field foal from Jerod Haynes. The Danger poured it on, beginning with a three-yard run from Davonte Sapp-Lynch. Nebraska added a rouge on the ensuing kickoff, then increased their lead to 39-13 on Thomas' 27-yard pass from Armstrong. The Bucks got back on the board on the final play of the second quarter when Gibbs run in from 16 yards. The Danger led 39-19 at the intermission. Sapp-Lynch scored his second touchdown of the night on a 27-yard run just over a minute into the third quarter. Gibbs's five-yard rush drew the Bucks to within 46-25 before Sapp-Lynch struck again; this time on a run of a yard, and the Danger led 53-25 after three quarters. Bismarck scored on a 31-yard pass from Gibbs to Tatum, and Nebraska counted with a 23-yard touchdown from Armstrong to Thomas. Gibbs added a two-yard run with 3:59 left in the final quarter. Armstrong found Tavaris McCormick for 48 yards to put the Danger up 66-38 with three minutes left. Gibbs ran in from a yard out with 20 seconds left to provide the final tally of 66-44. The Danger outgained the Bucks in total offense, 275 yards to 256, including a 177 to 58 edge in the rushing game. Bismarck was penalized 10 times for 68 yards, and Nebraska was flagged six times for 44 yards. Bismarck led in time of possession, 37:57 to 22:03. Armstrong completed eight of 12 passes for 158 yards and four touchdowns, along with a rushing touchdown. Sapp-Lynch was exceptional in his debut with the Danger, rushing 15 times for 94 yards and three touchdowns.Thomas added 58 yards off four receptions to go along with his two scores. Clarence Counts and La'More Wise each had six total tackles for the Danger defense. Lavarious Varnado had an interception, while Charles Walker recorded a sack. added three receptions for 53 yards. Antwan Smith had seven total tackles and Stephon Hall had a fumble recovery for the Bucks' defense. 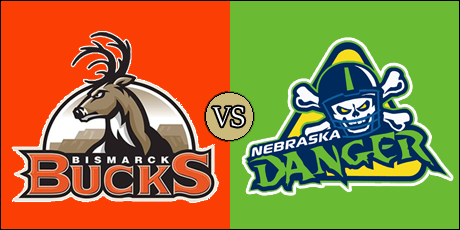 The Danger are next in action on March 1 at 5:05 p.m. (pacific) when they visit the Green Bay Blizzard. The Bucks have a bye in week 2, but return on March 10 when they face the Tucson Sugar Skulls. That game features a 3 p.m. (pacific) kickoff. I got a chance to catch this game. Armstrong was amazing. He is definitely Italy one to watch in the IFL this season.